Trimble selected the 2018 winners of the Tekla BIM Awards in six categories. 727 West Madison (Pepper Construction) — 727 West Madison is a 46-story cylindrical apartment tower in Chicago’s West Loop neighborhood and will be Chicago’s tallest building west of the Kennedy expressway. Located on Madison and Halsted, this iconic building with street-level retail spaces will incorporate banquet halls, a business center, pool and health club to be shared with the adjacent 400-room hotel. Pepper Construction’s Self Perform Group is serving as the concrete subcontractor on this project pouring over 27,000 cy of concrete from May 2017 through May 2018. The project completion is scheduled for Fall 2018. Statue of Liberty Museum (High Concrete Group) — The Statue of Liberty Museum is a new museum on Liberty Island that features precast concrete panels around the perimeter, with the exception of a glass facade that faces Lady Liberty and gives patrons of the museum ta view of the statue from every angle. The structure also features a large staircase that leads to a green roof for a unique vantage point of Lady Liberty. High Concrete was responsible for the large insulated precast concrete panels around the outside. The panels have a very distinct vertical rib pattern and the concrete mix and finish were created to give the appearance that the panels rose up out of the stone around the island. The precast panels were designed to withstand flood waters and also interface with the steel structure. 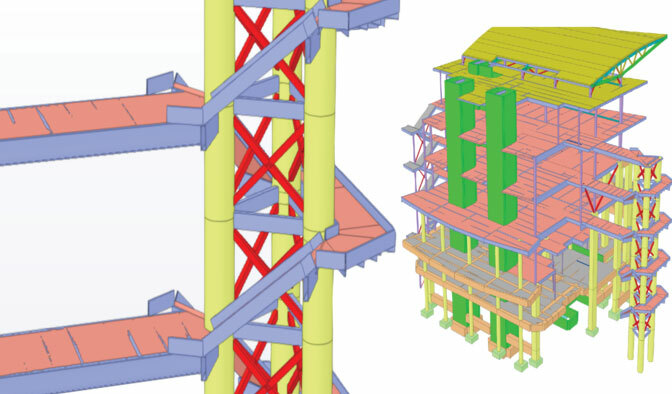 The precast concrete was modeled in Tekla Structures to a Level of Detail (LOD) 400, which means the concrete parts are modeled accurately and in their correct location, all hardware including lifting devices are modeled and all reinforcing were added to the pieces. University of Wisconsin – Music Performance Building (JMT Consultants) — The University of Wisconsin Music Performance Center is a 75,000-gross-square-foot building designed to be a marquee musical performance center for the University of Wisconsin – Madison students, faculty, and special guests. The building will host a 650-seat main concert hall, a 320-seat recital hall, a rehearsal room for the full orchestra, and assorted spaces for public and private administrative use. The structure of the building is a hybrid of steel, concrete walls, and a few glulam beams. Steel framing and decking rises from the basement and supports all floors and roof areas. However, the Concert Hall is framed by 80-foot-tall walls poured with self-consolidating concrete and braces steel on all sides. Large concrete acoustical chambers also rise 30+ feet from a supported concrete slab on the second-floor level. The roof of the Recital Hall is framed by glulam beams and wooden decking. The exterior will consist of curtainwall window systems, V-Shaped precast panels, metal panels, and stone veneer. Nestle USA Headquarter Monumental Stair (Crystal Steel) — Nestle USA Headquarters monumental stair is a small, yet very complex project. This project contains a challenging compound curve shape (oval staircase) with lighted plate railings covering the entire stair frame. The unique nature of the inner guarding on the stair as it slopes to the vertical, as well as being curved in plan to follow the helical shape, presented challenges.The painted 14GA carbon steel cladding ribbed with 3/16” thick laser cut steel cladding and rail support paired with illuminated handrails and stair underside cladding that follows the bottom slope of the stringer even makes it more interesting, if not daunting. Foniles del Nuevo Aeropuerto Internacional de la Ciudad de Mexico (Constructora Terminal Valle de Mexico) — The original New Mexico City International airport created by Foster+Partners, FR-EE and NACO will have a surface area of 7,997,585 square feet and will be modeled entirely in Tekla Structures and represent the largest Tekla model ever created on a global scale. The entire terminal building will be covered by a continuous light Space Frame that will unify walls and roof in a fluid design that represents the fluid movement of flight. With spans as big as 328 feet wide, or three times conventional airport spans, this monumental scale was inspired by Mexican architecture as well as symbolism. The largest interior span is 558 feet in length. Cincinnati Tennis Center Court South (Lawson Esler) — Located at The Lindner Family Tennis Center in Mason, Ohio, the new 40,000 square foot South Building stands 104 feet tall. BDMD Architects planned and designed the building and LEI provided structural engineering services on the project. The multi-material building stands atop 70 drilled shaft foundations that are 30 feet deep in the soil. The building rises from the ground on 22 cast in-place concrete columns. The precast seating facing the center court is supported by four cast-in-place concrete raker beams. To handle the gravity load from the seating these raker beams were supported by prestressed concrete beams at the top and bottom. These prestressed beams span 95 feet, allowing for an unobstructed view for the 252 air-conditioned box seats below. The building has slabs on metal deck typically at every floor supported by beam girder system. Level four and five are supported by steel structure. The building has two steel trusses that span 95 feet, giving a clear floor span at the fourth and the fifth floors. The canopy on the building comprises of five steel trusses that cantilever over the box seats by 30 feet and gives the building its height of 104 feet above ground. The building is primarily supported against lateral wind and seismic loads by three concrete elevator shafts. View all of the projects at https://www.tekla.com/us/bim-awards/projects.